Heritage Marker #3 of the Georgetown Pathways to History Project, which was developed by the Georgetown Heritage Advisory Committee with assistance from the Sanford Museum and Sanford Historical Society. Georgetown was established by the city's founder, Henry Shelton Sanford (1823-1891, as a suburb for African-American residents in the 1870s. The neighborhood spans along Sanford Avenue, with its commercial district between First Street and Fifth Street and its historic district between Seventh Street and Tenth Street. Though originally much smaller, Georgetown spanned to its present boundaries from East Second Street to Celery Avenue and from Sanford Avenue to Mellonville Avenue. Georgetown thrived at its height from circa 1880 to 1940, particularly in agriculture and transportation. Special thanks for Heritage Marker #3 was given to Patricia Ann Black (1956-), the daughter of Pilgrim Black (1905-2002) and Lula Mae Haynes Black (1917-2007). Her father, Pilgrim, was featured on the marker. Pilgrim was born in 1905, although some records list 1907 as his birth year. Pilgrim and Lula Mae Haynes (1917-2007) Black were migrant crew leaders, and thus migrated to Wayne County in Upstate New York in the summers and back to their home in Sanford for the rest of the year. Pilgrim was the son of Harry Black (d. 1911) and Maggie Benjamin Black (ca. 1870-ca. 1934), who migrated to Sanford from South Carolina in the 1800s. Harry and Maggie had several children: Leckward Black, Mustar Black, Malachi Black, Leatha Black Walker (1889-1976), Pilgrim Black, Margaret Black Jones (1889-1976), and Harriett Black Lawson. In 1911, Harry owned a grocery store at 206 South Sanford Avenue. One day, he came home from work with pneumonia and passed away shortly thereafter. Pilgrim was nine years old when his father passed away. Maggie was the daughter of former slaves, Isaac and Roseanna Benjamin, and the sister of Nathan Benjamin, Pledge Benjamin, Sam Benjamin, Loui Benjamin, Chainey Benjamin, Lara Benjamin, Melvina Benjamin, and Katie Benjamin. Pilgrim had to quit school at age 11 in order to provide for his mother, originally working in a mill house until he was 18 years old. After declining a management position, he traveled to Wayne County to pick cherries, apples, pears, and other crops. He broke a bone after falling from an apple tree his first year and decided to try farm labor on a potato farm in Red Creek, New York, instead. Don Holdridge, the farmer who owned the land, noted Pilgrim's high rate of productivity and offered him a management position supervising up to thirty workers at once, which he accepted. While in Sanford, Pilgrim also worked as a foreman in Sanford for Chase & Company for over 30 years. He married Lula in 1937 and they had several children together, including Vivian Louise Black (1940-); Lula Yvonne Black (1942-); Charles Samuel Black (1945-); Pilgrim Black, Jr. (ca. 1947-), and Patricia Ann Black. Original color marker by the Georgetown Heritage Advisory Committee, 2014: Department of Recreation, City of Sanford, Sanford, Florida. 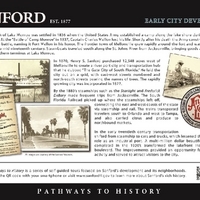 Originally created by the Georgetown Heritage Advisory Committee and published by the Department of Recreation of the City of Sanford. Copyright to this resource is held by the Department of Recreation of the City of Sanford and is provided here by RICHES of Central Florida for educational purposes only. Georgetown Heritage Advisory Committee. “Georgetown Pathways to History Project Heritage Marker #3.” RICHES of Central Florida accessed April 20, 2019, https://richesmi.cah.ucf.edu/omeka/items/show/4659.